As a company, Rolex has far more often set the rules than played by them. They have remained as unaffected by the prevailing and usually fleeting trends of the day as it is possible to be, and nowhere is that more evident than in the dimensions of their watches. While all about them the output of rival manufacturers has been growing ever bigger over the last 20-years or so, Rolex has only very recently, and begrudgingly, started to introduce larger models. The evolution of the brands’ watch sizes has been an especially gradual one, as is every change they make. For the vast majority of their time, they have kept their core family consistent; 36mm as a maximum for the dress pieces, 40mm for the tool watch collection. Of course, it hasn’t always been that way. In the very earliest days of both Rolex and of the wristwatch itself, any piece measuring even 36mm would have been seen as impossibly huge. Tastes have changed dramatically over the years since the concept of a watch you could wear took over from one you kept in your pocket. So below, we will take a look at how the sizes of Rolex’s finest have developed, and what might happen in the future. When the trench combat of WWI proved once and for all the usefulness of a timepiece that didn’t need two hands to operate, it marked the beginning of the wristwatch’s ascendancy. Before then, they were solely the reserve of women, with the pocket watch being the only acceptable way for men to tell the time. But with battle scarred soldiers returning home from the frontline sporting jerry-rigged models strapped to their arms, the image of a lady’s delicate accouterment was turned a complete one eighty. Rolex was at the forefront of this new wave, racking up in quick succession the two innovations that sealed the wristwatch’s reputation; the self-winding Perpetual movement and the waterproof Oyster case. Even so, styling-wise, it took a little time to break away from the design language of the pocket watch. Almost uniformly round in shape, to ensure they didn’t snag on clothing as they were removed, their movements were similarly circular. The calibers that made their way into the earliest wristwatches were simply scaled down versions of those mechanisms, and kept the shape of the cases round by necessity. It would take the likes of manufacturer’s such as Bulova and Gruen to start experimenting with different forms, making square and rectangular watches, with correspondingly fashioned movements. Yet, the sizes of all these nascent creations were still tiny by today’s standards. There appeared to be a self-imposed limit on round models not to exceed 32mm, with 26mm to 29mm the upper threshold for rectangular pieces. Rolex rarely broke with those constraints until the 40s and the entrance of the Datejust, really the start of the modern company as we know it today. Released in 1945 to commemorate their 40thanniversary, it arrived with a conspicuously large 36mm case. The extra surface area helped to accommodate the revolutionary date function while still keeping everything legible, something that would have been difficult on a smaller canvas. It paved the way for 36mm models to become the definitive size for a man’s dress watch, and it continued for decades. However, with the dawning of the 50s, a new genus of timepiece was to make an appearance. Models designed to be worn by those engaged in all sorts of adventurous or hazardous activities warranted an increase in dimensions, both to lend an inherent strength and to make reading them that much easier. While the Submariner, the first of these so-called tool watches, stuck at 36mm for its two initial and short-lived references, by 1955 it had added a couple of millimeters to its shell. Four years later, with the grail-like ref. 5512, it had become the 40mm piece it has remained to this day. 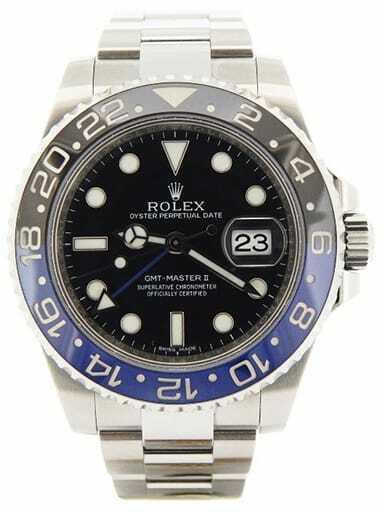 Likewise, that other legend of the brand, the GMT-Master. Kicking off at 38mm, by 1959 it had grown to 40mm and has stuck to it religiously ever since. Over the subsequent decades, Rolex released a hatful of different creations, all of them staying within the boundaries the brand had drawn up for themselves. Even models destined to be used by hardy professionals working in some of the most hostile environments imaginable, names such as the Sea-Dweller and its mammoth water resistance, or the Explorer II, with its no-frills robustness, all stayed within the 40mm boundary. It would take until the 1970s before things started to shake up. While quartz technology devastated the horology world more than anything before or since, as far as the sizes of the watches were concerned, it didn’t bring about an enormous change. Dimensions still lingered in the 32mm to 36mm range, even powered by crystals and batteries. Over at Rolex, after watching scores of other traditional manufacturers dropping like flies around them, they initially joined part of a conglomerate to develop their own quartz movement. The result was the Beta-21, which went into action inside specially made models from more than a dozen different brands. Large and awkwardly shaped, Rolex built the ref. 5100 round the movement, not having an Oyster case big enough to fit the new caliber. At 40mm, it was a dress piece sized like a tool watch, but even thicker and chunkier, with an integrated bracelet that gave it the look of an Audemars Piguet Royal Oak—which is understandable, seeing as they were both designed by the same man, Gérald Genta. It was little more than a prototype and limited to 1,000 units, so when Rolex decided to make their own quartz movements, they ensured they were small enough to fit inside 36mm cases; reworked versions of the Datejust and Day-Date. So it wasn’t the 70s that started the whole trend towards bigger and bigger watches. Credit for that goes to the heady 80s, and the arrival of the wristwatch as status symbol. With the attitude of ‘if a little is good, then more must be better’, several brands cottoned-on to the fact they could just increase the sizes of some of their existing and iconic designs for a whole new audience. So, we got a 42mm ‘Jumbo’ Nautilus from Patek, to run alongside their 37.5mm originator. Similarly, makers like JLC brought out larger editions of the Reverso, and IWC beefed up their pilot’s watches. Pretty soon, it descended into a race, with competing companies trying to outdo each other with who could build the biggest but still wearable watch. With models at the top end sometimes living in the 50mm+ range, the overall average for the wristwatch got bumped up in turn. The once enormous 40mm sizes became very much run-of-the-mill, and even seen as too small for a tool watch in some quarters. And Rolex? Nah. As far as they were concerned, the ideal size was the same as it had been since the end of the 50s. As the undisputed industry leaders, they were happy to keep their portfolio as it was. But even that most insular of watchmakers couldn’t hold out forever. The first halfhearted concession they made was the arrival of the Supercase in 2005. Extended across the Professional Collection over the next few years, it retained the same 40mm dimensions on paper, but with its heavyset lugs and crown guards twice the thickness of previous iterations, it gave the impressionof a greater size. It may well have been the fanatical reception this ‘larger’ model received, but it seemed to inspire Rolex to come out with a flood of updated watches with more wrist presence. In 2007, the Yacht-Master II, at 44mm, became both their biggest and most complicated model to date. Over the next couple of years, the almost unthinkable happened, with 41mm versions of their two longest serving archetypes joining the party. Although the Day-Date II and Datejust II had relatively brief stints due to their somewhat inelegant proportions, they were replaced with similar sized models which are still in production and have proved massively popular, running alongside the time-honored pieces. 2008 saw the demise of the Sea-Dweller, replaced by the behemoth Deepsea, another 44mm model. Then, in quick succession, the Air-King, Oyster Perpetual and Explorer all grew from the traditional 36mm to 39mm. The Sea-Dweller made a triumphant return in 2014, still at its customary 40mm, but three years later, another major shock occurred when the updated edition weighed in at 43mm. The latest surprise? A 42mm Yacht-Master unveiled at Baselworld 2019. It’s obvious Rolex has been slowly increasing the size of its watches for the last 10 or 15 years, in response to the prevailing market demands. The only models which have stubbornly refused to grow up are their most famous creations; the Sub, GMT-Master II and the Daytona. But surprisingly, the race by other manufacturers to create the largest watch imaginable seems to be over. The most recent offerings from some of the big names in the business have seen them taking a step back in dimensions. Even makers like Panerai and Breitling, purveyors of all things macho and testosterone drenched, have released smaller editions of pieces such as the Navitimer or the Submersible, and Omega has brought out retro-inspired versions of the original Seamaster, coming in at 38mm. The massive popularity of vintage mechanical watches could well be driving this return to more familiar sizes. Manufacturers are responding to the overriding adoration of their archived models by reissuing faithful homages, including their period-correct sizing. While it is unlikely we will ever return to the 36mm watch as the standard, it is good to know we probably won’t be seeing a classic from the Rolex stable become massively overinflated in order to keep up with the trend. A 48mm Daytona, for example, is something I know I can live without. In the end, while the brand’s watches have certainly increased in size over the more than a century they have been in operation, they have remained at the lower end of the scale when compared to rival companies. When you are Rolex, there is no real need to shout about it.